West Coast Equine provides ambulatory services to our regular clients within our practice area. Because the veterinarians must remain near the hospital to attend to emergencies and critical hospitalized patients, our radius of ambulatory calls is limited. Our ambulatory service provides preventative medicine services, reproduction, lameness, pre-purchase examinations and emergency calls to the surrounding area. We offer thorough and timely service to the local area and enjoy a rewarding relationship with our clients and their horses. We consider preventative medicine a very important part of a horse's health care and we recommend up to date vaccination and deworming protocols. 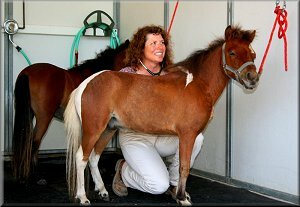 General horse care including routine and motorized dentistry procedures, health and weight management recommendations and microchip implantation for equine identification are also offered in both our ambulatory and out-patient services at the hospital. Both Dr. Sullivan and Dr. Kemper provide consultation for the area veterinarians and may be able to evaluate a patient in the field to determine if it needs further services at the hospital. Dr. Kemper is also approved for inscriptions of Andalusian horses through US Prea and ANCEE. EquiPride nutritional supplements are also available for purchase at our hospital.